Beachbody’s mission is to end the trend of obesity. Obesity trends among children in America have become out of control. This is why Beachbody has also produced several great workout DVDs for kids. Not only will these workouts get the kids active and away from the television and video games, but the kids will also have fun doing them. Tony Horton, the animated trainer that has become popular from the hit workout P90x, also has a workout DVD for kids, called, Tony And The Kids. This workout program is for kids ages 5-12. Along with the workout, Tony goes over the advantages and importance of eating right, staying active, and making healthy choices. There’s never been a better way to get your kids excited about exercise and give them a fun way to burn off that excess energy! Tony is the perfect “big kid” to motivate and lead children through a wide variety of fun and simple routines that anyone can do. They will love every stretch, hop, jump, kick, and twist as they laugh their way through all of the routines. Shaun T, the trainer behind the hit workout Insanity also has a workout DVD for kids called Shaun T’s Fit Kids Club. Shaun T’s workout is for kids ages 7 and up. With a childhood obesity crisis sweeping the nation, choreographer to the stars Shaun T wanted to create a program that would get kids off the couch and on their feet. Not only will the kids get active, but they also will get snack tips and learn how to read nutrition labels properly. 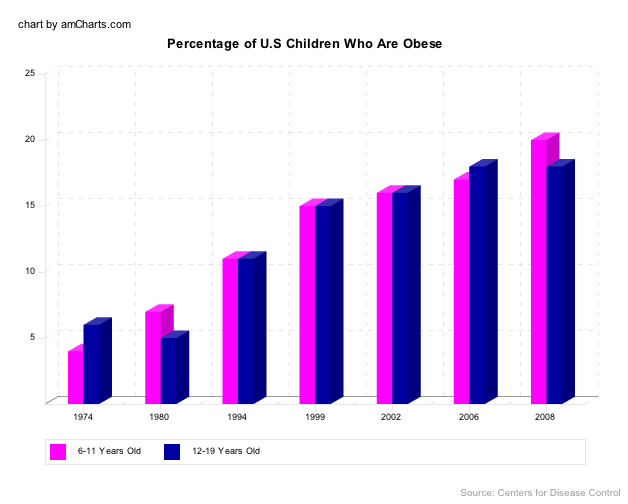 In 2008, more than one third of children and adolescents were overweight or obese.